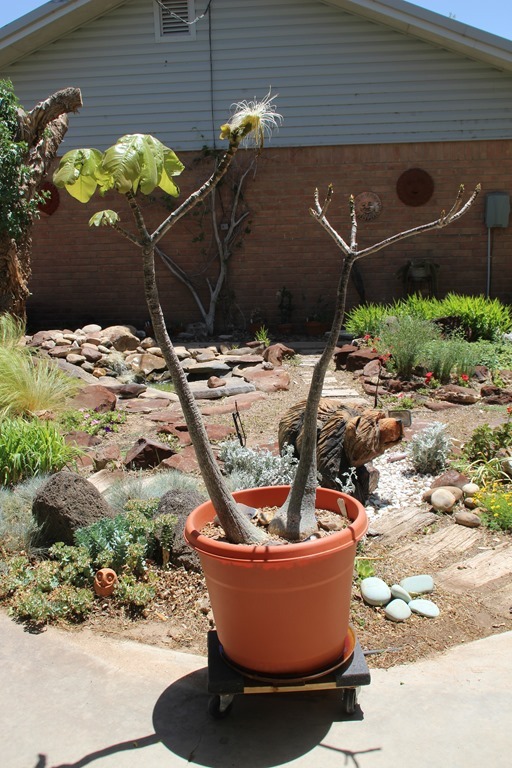 I bought this bombax tree back in 1985 when I was first getting interested in the more unusual specimens I would come across when searching for cactus and succulents. It was in a one-gallon container then and about a foot tall. Today it is in an 18-inch pot and the plant itself is 4 feet tall. The tree only blooms in the spring before the leaves appear after the cold dry winter. What you see here is the second bloom this season. It opened yesterday; they only last a day, blowing away the next day. No blooms have formed on the trunk on the right, which makes me wonder if I have a male and female tree. I know it doesn’t look like much now, but by the end of the summer when I have to bring it in for the winter, it will have made a nice canopy of large leaves. Alas, I don’t think I have an older picture of it all leafed out. You will just have to use your imagination. Back when I bought it, I did not realize I would some day wish I had paid more attention to identifying it precisely. The pot was just labeled bombax as I recall, and I didn’t think much of it until these last few years when I have been paying more attention to classifying my plants. So after some investigation, I think it is a pseudobombax ellipticum, or bombax ellipticum bombacaceae, a member of the kapok family, which is a member of the mallow family, which is where kapok comes from. The wood is very light weight and is used for carving, making dugout canoes, and coffins. 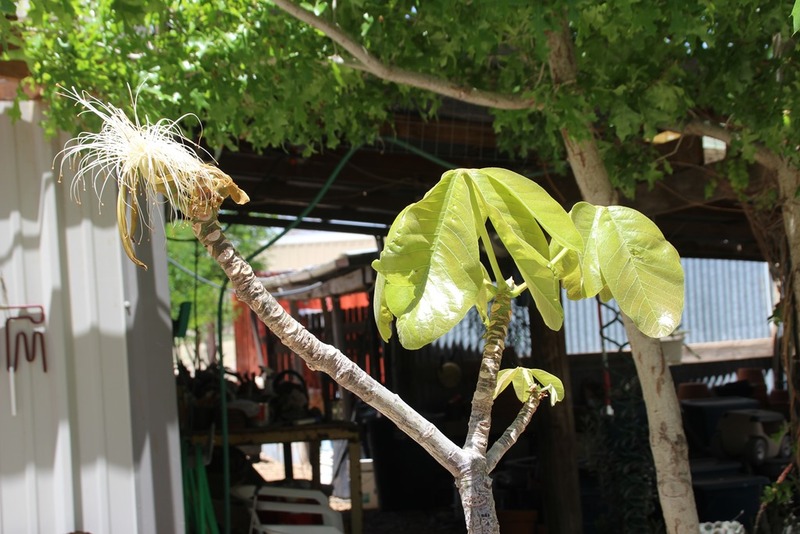 Some parts are used for medicine, the oil from the seeds can be used to make soap, and the filaments from the flowers can be used for bedding and fillers. Now I don’t know that my bombax tree can be used for all that, but some varieties can. 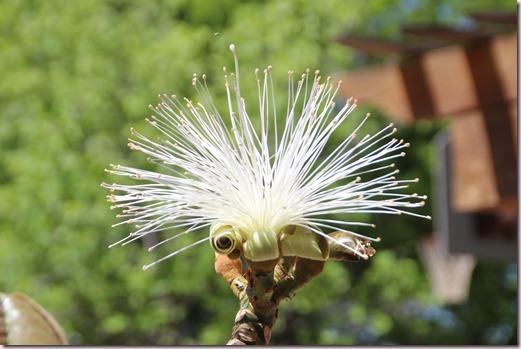 The tree is native to warm climates and rain forests, and I know some grow in Hawaii because they were pointed out and called a shaving brush tree when we visited there in the late 90s. 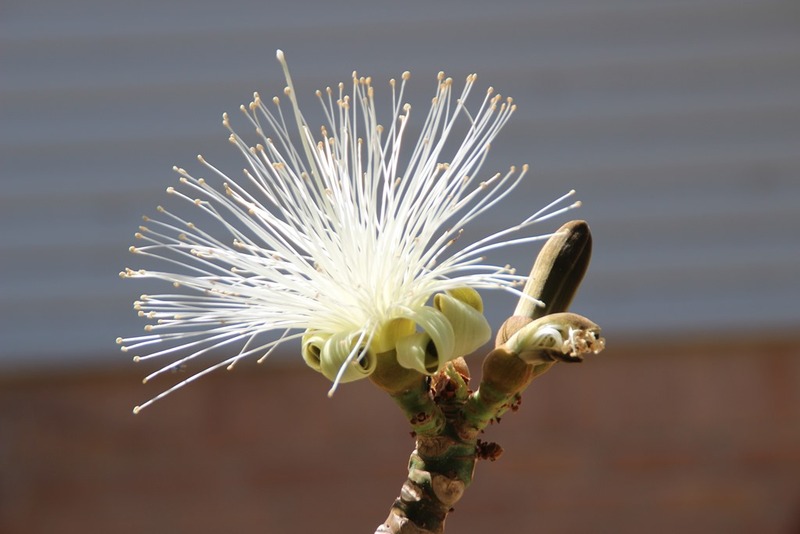 And you can see why they are called shaving brush trees when you see a fresh, newly opened flower. Some kapok and bombax trees have a different kind of flower and of different colors, but these flowers do sort of look like old-fashioned shaving cream brushes-for those of us old enough to know what those look like! 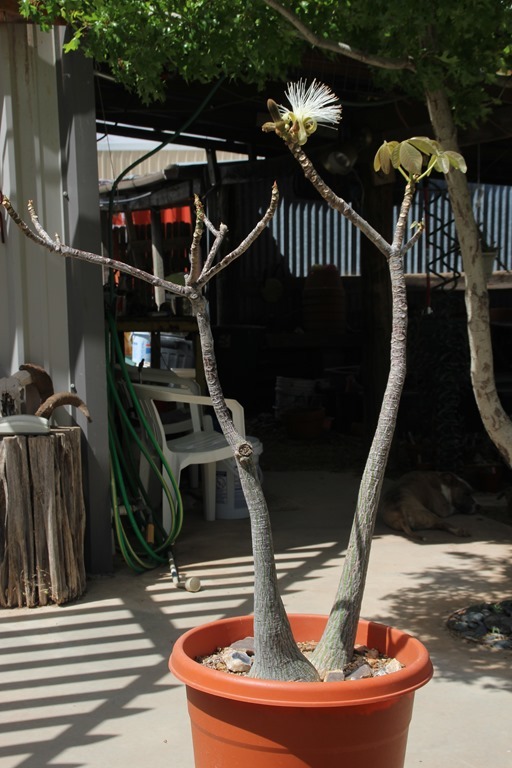 Some day the tree will be too tall to go through the door and I will have to cut it back, after which it will take on a different shape and the caudex, the fat bulb at the base of the trunk used for storing water, will probably be fatter and even more interesting-looking. And I suspect it will outlive me by many years. I have plenty of small shaving brush trees growing white & Pink. Specimen Trees with the Bombax ? 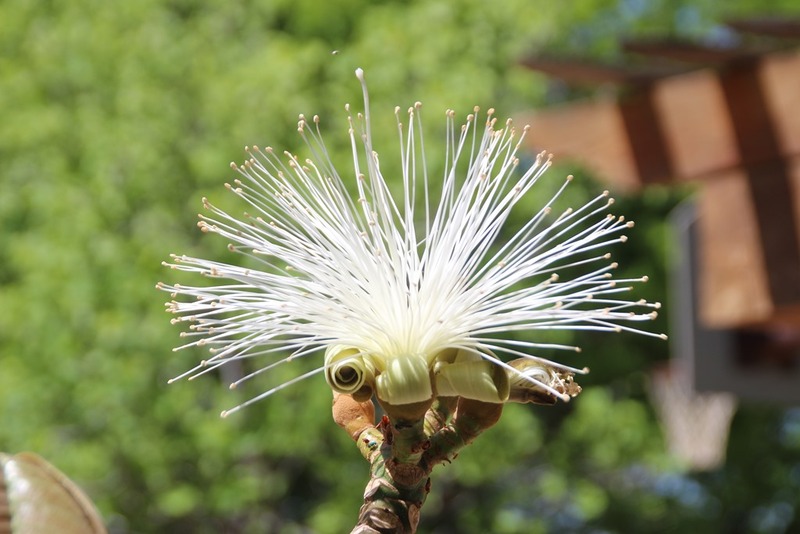 I’m afraid I don’t know much about the bombax tree other than the interesting flowers they make! I guess we will both have to google it. But thanks for reading. Beautiful! And good job flowering it in a smaller pot! I’m pretty sure you have two plants in the pot. These don’t have t separate sexes on different trees. Flowers have both male and female parts. If you look at a just-opened flower, the pistil is far from the stamens, so it’s unlikely to self-pollinate. 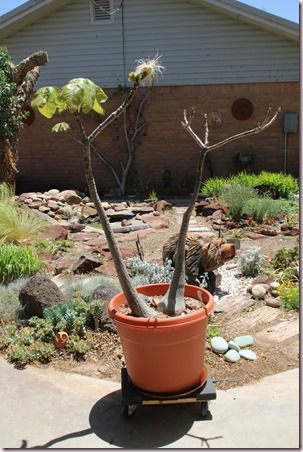 Friends here in metro Phoenix, Arizona have single specimens flower regularly, but don’t get seed. I have read you can self-pollinate the flowers to get seed, but I don’t have experience with this. Since flowers are white, and open at dusk, and have long flower parts, a moth might be the pollinator. Bombax and ceibas are closely related. Botanists have united the bombax family with the hibiscus – cotton – okra family, Malvaceae. 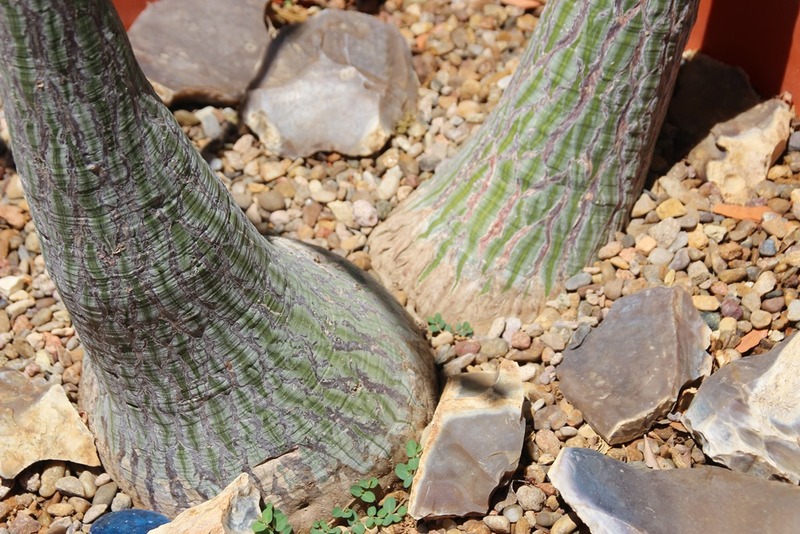 They also changed the name for this plant to Pseudobombax ellipticum. You might find more about it if you search on that name, though almost all gardeners use the old name. Treat these plants as though they are their relatives, okra or hibiscus. Seed sprouts easily if planted in moist soil, kept hot and very moist. Seedlings grow rapidly. They will sunburn easily in heat, so be careful. I don’t think you could overwater this plant during hot weather. It is very sensitive to water during cool to cold weather, though. The pink-flowered one appears to have originated just once, in Mexico. You can see four large pink ones in the town square in Tehuantepec in southern Oaxaca. I’ve also seen them here and there in gardens in Mexico, but never in the wild. All the pink ones I’ve seen are clearly cutting-grown, without the bulbous base, or grafted. Cuttings don’t develop the bulbous base. You can find pink ones grafted onto white seedlings here in the US, and those develop the bulbous base. Thanks for all the info, Leo. Mine is getting so big, I fear it will have to be groomed to get it into the barn for the winter this year. Leo do you keep them in full sun during the Phoenix summer? Jonathan, I am not sure Leo will see your question, but I will post it and we’ll see.